Shane Carruth. David Sullivan. Casey Gooden. Anand Upadhyaya. Carrie Crawford. Jay Butler. Science Fiction. Technology. 01 Will's stamp of approval. 01 Kelly's Heroes. 01 Dave B's must sees. 01 Nigel's Choice. Cult. 01 Adam's Faves. Sundance Jury Prize: Dramatic. Recommended. Computer engineers Abe and Aaron spend their time between working, eating and sleeping creating machines that may one day revolutionize the world. It is while reaching the completion of one such invention that the two men realise they have inadvertently designed something that is capable of taking them to, and providing them with, all that their ambitious minds can imagine. As is so often the case when all one's dreams seem within grasp...this is where their problems really begin. 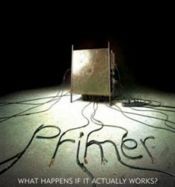 Primer is a mighty achievement by writer, producer, director and star, Shane Carruth. A tight, original and intelligent plot draws you in deeper and deeper, defying your ability to fully grasp what is taking place while cranking up the addictive tension right up to the tantalisingly unfathomable conclusion. Superlatively ambitious yet understated film-making....the temptation to watch it again is a hard one to fight. So go on...do it again.